Lately I have been reading a number of books addressing early childhood education and child development. I was initially looking for techniques that could potentially accelerate pre-verbal learning. To my surprise, a common denominator across all materials was the emphasis placed in confidence building. I know for many of you this is a season of long days and busy hours where reading may not be your priority #1. With this in mind I wanted to share a few principles to encourage you to raise confident little ones, able to face the world with aplomb. Your baby needs to know that you are engaged and observing their every action. Celebrate both effort and intent as a means of building a willingness to try again and again. Practice does make perfect. From an early age it is very important to begin developing the muscles of the mind and body that value repetition. Learn songs, rhymes and dance routines that help your baby grasp the concept of improvement through practice. Curiosity is at the heart of learning. Give your baby the opportunity to engage with their environment in ways conducive to exploration and experimentation. From a walk in the park to having new toys and puzzles that challenge the mind there are plenty of ways to help your baby learn through discovery. We all want to be the parents to a gifted and talented child; one whose precociousness delights and impresses others. Please don’t become a slave to early performance. Work hard at teaching your baby new things but always remember their age and season in life. Take time to observe what your baby loves best. Even in their first year little ones will have preferences for food and toys. Allowing a baby to favor certain experiences is helpful in developing a confident persona. Put a plan together that gives your baby a sense of progression in learning. Always have something new to encourage sensorial and intellectual experiences. 7. Don’t Do it For Them! Shortcuts are a bad idea. Give your baby plenty of chances to engage with their environment and complete tasks big and small to the best of their ability. Even when we are frustrated we should not convey negativity. Let our body language be full of encouragement. Did baby do something wrong? Don’t fret. Use the mistake as a foundation to learn and correct. This is specially important when teaching verbal skills as well as expressive language. Always be in the lookout for contextual learning. Babies feel and learn best when information is presented contextually or responsively. Confident babies receive positive feedback on a daily basis. Say it and say it often. Word of affirmation are life-changing. Your baby should never feel alone when facing challenges. Let your baby know that you are by their side and guide them in overcoming challenges. Many fears are innate. When your baby demonstrates the willingness to confront fear with courage don’t miss the opportunity to celebrate their valor. From birth take the time to show your baby structures of leadership. Knowing that there is someone in charge empowers us with the confidence that comes from the sense of being protected. Confidence is best expressed when we know that our needs will be appropriately met. Equip your baby with tools of communication as early as possible. From pointing to baby signs and facial expressions; everything that empowers your little one to have a quick and appropriate response to their needs will further their confidence. If you have babies, you have questions. In fact, the path of motherhood has far more questions than it has answers. I cannot begin to imagine how parenting looked like before Google and Facebook Mommy Groups. As for me, I am often questioning my approach and hoping that I will find a perfect roadmap to parenting somewhere. The good news is that there is no such thing as a roadmap. Sooner or later we will all get to similar stages and our babies will acquire basic skills at a providential pace. Unless there is an underlying learning difference or disability our babies will eventually, walk, sit, speak and engage in an age-appropriate fashion. Now relax and allow me to share with you six milestones that your baby will most likely reach before he turns six months old. Every single day your baby will grow stronger. In the beginning progress is likely to include arm motions squeezing your finger or reaching out to you. By the time your baby is three months old you will notice that their ability to hold their head up will improve and neck strength movements and routines will begin to happen naturally. Your baby will also be able to roll on their own and he or she may attempt to sit. Work on repetition and movement routines that encourage muscle engagement. 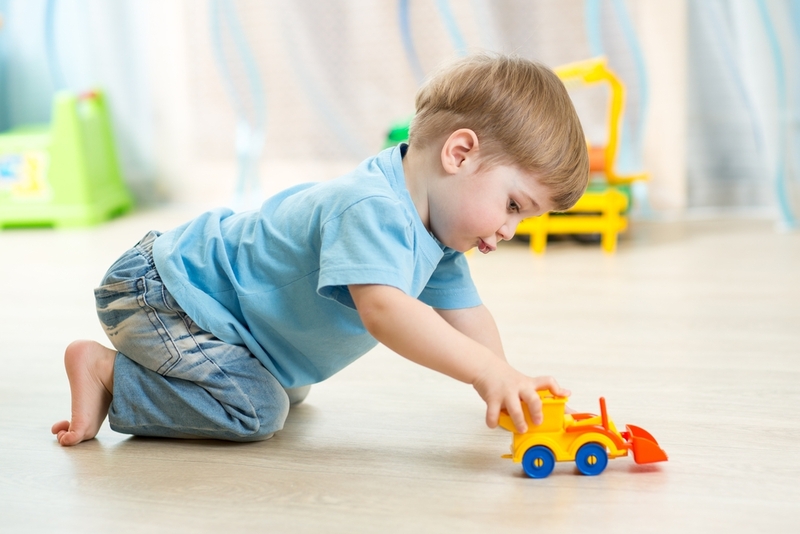 Teach your baby to pick up things, give them the opportunity to sit with support and play games that encourage rolling. This is one of the most delightful milestones! Your baby will follow you with his eyes, he will smile and will noticeably listen to your voice. Baby will babble when engaging with familiar environments and people. You will notice favorite people as well as favorite objects. Encourage recognition by using word repetition and using baby signs to help your little one make connections between visual input and concepts. One of the drawbacks of this milestone is fear. Your baby is likely to express discomfort with strangers. Take the time to expose baby to a variety of people and situations to increase their comfort with the world that surrounds them. This is the season where our brain develops the capacity to mimic certain sounds. Don’t miss out on the opportunity to expose your baby to foreign languages and music. Take time to explore the sounds of nature and animals and give your infant the opportunity to attempt imitation. Chances are he or she will simply babble but the real milestone is found in engagement and not necessarily in full use of the spoken word. By the time your baby reaches six months he or she will have longer periods of sleep allowing you to rest. Their body language becomes easier to decipher allowing you as a parent to better manage their times of rest as well as your opportunities to take care of other things around the house. We began to teach our little ones how to use the sign for tired when they turned five months old. By the time our girls were 8 months old they would sign to us allowing us to better manage nap time as well as other behavioral issues related to lack of sleep. Right about six months many parents begin baby-led food exploration. There is plenty that you can learn about your baby by giving them options and allowing them to select what and how much they will eat. During this milestone take careful notes and introduce only one new food at the time. This is also a good time to teach your baby the signs for “more” as well as “all done”. We have found that during this learning period there is minimal value in teaching words associated to specific foods. Wait until you identify their preferences and you can then introduce them to the signs specific to the foods they like best. One of the most memorable milestones you are likely to observe is your baby’s newly found ability to engage with others through expression. You will see smiles, laughs, frowns and possibly hand waves. Take time to encourage appropriate responses by modeling behaviors in appropriate settings. This is a great time to teach songs that incorporate signs and mimicry as well as well emphasized facial expressions. This is also a fantastic time to keep your phone on video setting. You will have many amazing firsts you don’t want to miss. If your baby is six months or less, or you are currently expecting now is the time to get a hold of your Ultra Baby Sign Language Kit or begin printing and watching our free resources. You will find that pre-verbal communication allows you to better connect with your baby and it can be easily incorporated in any part of their learning and development. Valentine’s Day is around the corner. Let’s learn a few signs to add to our signing repertoire. The flash cards are available in our free printable collection. You can also find our favorite signs as part of our baby sign language kits. In comparison with the rest of the world the United States is very much a monolingual country. While our counterparts in Europe usually speak 2 or 3 different languages in the United States only 15 to 20% of the population can be characterized as able to fluently speak a foreign language. As we move into a more global economy it is imperative that we do everything in our power to ensure our kids learn a foreign language or in the case of first generation or second generation immigrants that they preserve their familiar tongue. Baby Sign Language is the very first opportunity you will give your child to develop the ability of associating visual feedback with a verbal concept. That very ability will set the stage for fully grasping the idea that two different locutions or in the case of BSL a symbol and a locution can represent the same object or action. Every infant is born with the capability to mimic all sounds available across all languages; This ability quickly fades as the child focuses on the phonetic structure specific to the main language spoken at home. By the time a child is 10 months old his or her ability to mimic sounds begins to diminish as they focus on vocabulary expansion. With this in mind, make it your goal to expose your child to all manner of phonetic variation though music and through speech. At the same time use signs to serve as a connector between two languages. In our home we do it by singing simple songs where we simultaneously sign and say the concept and then we reinforce it in our second language of choice. Every language has sounds that are specific to it. If you are not a native speaker look for opportunities to expose your infant to native sounds through the use of videos, music or by hiring a caregiver who is a native speaker. Our flash card set is now customized with handwritten stickers that include the word in Spanish and French, By the time our babies turned 2 years old they had a vocabulary of over 50 words that they could sign and say in English, Spanish and French. If you are a new parent, don’t miss out on the opportunity to set the stage for a multilingual life. Your kiddo will thank you for a long long time. When a parent seeks out our resources we can safely assume that there is a great deal of love and enthusiasm towards learning. After all, baby signs are usually embraced by families with a higher level of education that firmly believe in the value of going the extra mile. If you are one of those parents perhaps you have faced moments of discouragement where you feel like you have missed nearly every milestone. If you are facing a season where everything seems uphill take courage; these resolutions may just be exactly what the doctor ordered. Don’t be stuck in a rut. If a particular teaching or learning method is not your cup of tea by all means experiment. What works for one baby does not necessarily work for another. Give yourself some grace and try something new even if it is out of the ordinary. For us, it meant abandoning traditional potty training methods and using full immersion. We literally took a week off to fully focus on potty training. It was intensive and totally non-traditional but it worked for us. One of my biggest and most regrettable parenting mistake was to always take the learning process way too seriously. I would often stay up reading the latest and greatest parenting books and finding every possible way to apply it to the day-to-day of our children. If you are new at the business of parenting I strongly encourage you to take it easy. Raising a child whose heart is ready to embrace joy is far more important than any other life skill we can teach. Constantly strive to add a bit of fun to every didactic activity. Be in the business of building happy memories. In saying no to the things that don’t matter, we begin to say yes to the things that matter the most. Prioritizing is essential during the first year of learning. Use the time that is available to you and your baby to engage in learning processes that will last a lifetime. Teach emotional skills, teach character and teach them how to learn. Once they have the basics downs everything else will be a breeze. I cannot stress it enough. Learning how to wait will transform the way you teach your baby and will radically impact the way your baby learns. Always reward your baby for having a positive attitude while waiting for something and make an effort to shape your character and responses in such a way that all your baby perceives is radical and loving patience. The fastest way to parental fatigue is to do it all alone. Whenever possible involve everyone in the family in the efforts of teaching new concepts and ideas. From learning to eat solid foods to walking our first steps it is always easier if everyone is on the same page. I have made it a point to send a monthly email to grandparents, aunts and best friends highlighting our learning achievements for the prior month and providing insights on what we are planning to learn in the next 30 days. Their support has been invaluable. The things we teach our baby are only as good as our knowledge. Invest in having first class materials as well as the best references to ensure the knowledge you are transferring to your little one is accurate. When we first began designing our baby sign language kits we did it because the resources available did not take into account best practices in teaching and learning communication skills. When you encounter a barrier, be hands-on and solve it. On occasion you will have to cobble together your own resources to accommodate to your child’s learning needs. Your choice of early childhood care will define many aspects of your child’s development. Pick wisely. A caregiver must share your vision and passion as well as your teaching style. Your babysitter, nanny or daycare should be holistic in their approach to raising little ones in a collective setting. There is a reason why Montessori style learning is never out of style. All children regardless of their age appear to learn best through imitating their peers. Be resolute when it comes to establishing functional social networks for your infant. Make friends from the very start. Make time to attend play group or host one at your home. When it comes to growing and learning, friendships do matter. Every baby is different in the way and pacing of their learning. Don’t allow discouragement to be part of your life. Be your best cheerleader always looking for better ways to share knowledge with your baby to create the strongest foundation possible. When it comes to your baby, may your war song always be go mama go! For many families winter is a special time of discovery and a time to build memories. Some head to beautiful ski resorts for a few days, others are lucky enough to live in a place where snow is a natural feature of the winter season. How to teach baby to sign wind? How to teach baby to sign snow? Teaching baby to sign snow depends on the weather conditions in your area. If you are fortunate enough to have snow it will be as simple as walking outside and doing a little outdoor playing. If that is not the case you can opt for videos, pictures or illustrations of snow. If your city is hosting a festival of lights there is a good chance they might have a snow machine making it a perfect setting to practice this new baby sign. If you want to add magic to the experience why not learn how to sign snow by making a homemade snow globe. You can find the instructions here. How to teach baby to sign cold? This is an easy and fun sign to teach and you can do it at the same time you teach baby to sign hot. At home we put two containers one with iced water and the second container with warm water. We help our toddlers feel the temperature and teach the sign in context. similarly we make an ice pack and plug in a hot pack and allow baby to touch both to help him or her understand that temperature changes are not only associated to water but to everything in our environment. Send us your videos and photos of your baby signing cold, wind and snow to [email protected] or share them on our Facebook page. If you are a new mama or a new to signing mama you are probably mystified by the idea of a pre-verbal baby communicating through signs. You have asked friends and family and now you are recurring to the internet to finally figure out how exactly is it that babies learn their first signs. Believe it or not your baby already signs. Expressive communication through the use of our hands is the normal default means of communication of any child under one. When your child reaches, pulls or waves bye bye he is in fact using signs to communicate. The most successful and quickest signers are the babies of families that make it a point to use basic signs all the time. Pick your most useful signs and use them without fail every time it is contextually correct to sign the concept. Just like we speak to our babies from the time they can hear us, signing from birth accelerates visual learning. Even when our babies are not yet able to sign they will be able to respond to certain visual queues. If you are a working parent don’t feel like baby signs are not an option for you. Many daycares nationwide use our program and resources to reinforce skills learned at home or to introduce babies to their very first signs. As tempting as it is, we encourage you to stay away from trying to teach your baby full baby sign language. All your baby needs is enough words to feel empowered until he or she is able to convey all that he or she needs or wants. The benefits of teaching your baby how to use baby sign language are endless and so are the number of signs available to learn and teach. 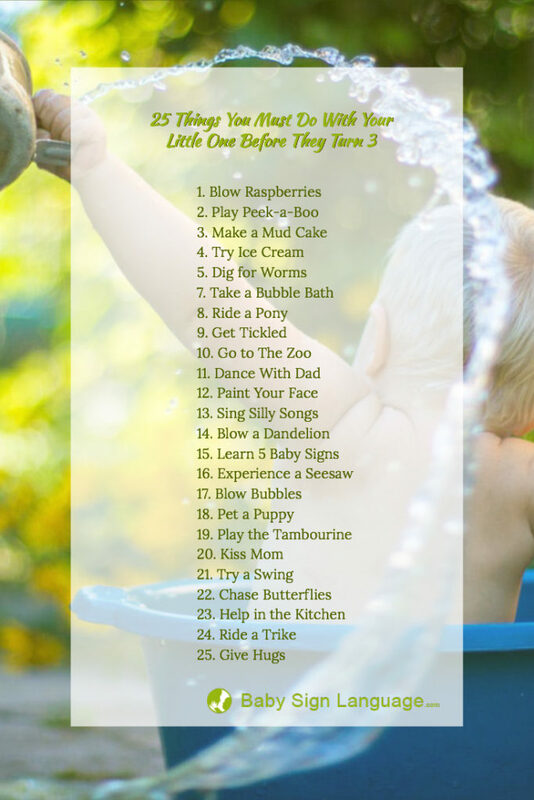 If you are a first time mama or a daycare provider trying to prioritize and ensure the signs your babies are learning are relevant and useful take a moment to review this list. We have selected the most popular baby signs taking into account the needs and wants of little ones in the pre-verbal stage. Nothing more frustrating than not getting enough. Not enough cuddles, not enough milk, not enough rest. The sign for more is super simple and babies as early as six months should be able to learn it with ease. The sign for more brings both hands together with fingers meeting at the center. This is the ultimate favorite. I have seen babies as young as four months learn to sign milk. The baby sign for milk is performed with just one hand. The difference between the sign for breast milk and the sign for bottled milk is the proximity of the sign to the breast area. All done is a partner sign with more. Teaching our babies to communicate the need for additional resources or having reached the point of satiety is a great help in reducing temper tantrums. All done is signed with hands in front of you doing a turn around motion as to convey emptiness. I can’t tell you how much we love teaching this sign. As babies explore their first foods it is lovely to see them combine the sign for eat along with their favorite treats. Eat and food are the same sign and it is achieved by bringing your dominant hand toward your mouth as if in holding a small sandwich. We used the sign for drink for a long long time. Even our preschoolers use the sign to quietly communicate the need to get a drink during quiet time. To sign drink our dominant hand holds an invisible cup and takes it toward our mouth. Aside from using the sign for water for obvious things like thirst we had a great time incorporating the sign during swimming lessons, our bath time and when doing crafts that required water. To sign water we make a letter W with our dominant hand and we take it toward our mouth. There is a very delicate balance between equipping a toddler to be independent and ensuring they feel safe, cared-for and empowered to secure aid. Our babies knew the sign for help as soon as they started walking. Make a flat palm and place your opposite hand on top of it with the thumb up. Raise both hands together. The sign for hurt has proven to be extra helpful when our little ones are injured or sick and unable to fully convey their suffering. We normally teach our babies and toddlers to point to the area of pain and sign hurt. To sign hurt tap your index fingers together. Another source of discomfort and frustration commonly encountered by babies is temperature variations in food and in their environment. Learning the sign for cold early on will empower them to ask for relief when in need of an extra blanket or when a cup with cold water is likely to help with their thirst. To sign cold your mimic a shiver and bring your arms close to your body. Just like cold the sign for hot can serve a number of functions in the daily interactions we have with our babies. From communicating a fever to letting you know that food is at a temperature that may burn. To sign hot you make a C shape with your dominant hand start at your chin and move it away from you and toward the other party. Using the sign baby serves in teaching our little ones self awareness. This was definitely not one of our first signs. We taught the sign for baby when our little ones turned 14 months. To sign baby we make a motion that mimics cradling a baby back and forth in our arms. This is among our top five signs. Teaching our little ones to call for us provides endless comfort and empowerment. To sign mom we tap our chin with our dominant hand extended with fingers separated. Just like the sign for mom we teach and learn the sign for dad to give our babies a sense of security in relationships. To sign dad we bring our open hand to our forehead with the palm facing toward the center and we tap. It is funny to include the family pet as part of the top 15 signs but the reality is that most households with pets consider Fido another member of the family. To sign dog we tap our leg with our dominant hand as if in calling our doggy to come. Tired babies are cranky babies. This is why the baby sign for sleep should be among the first signs we teach our little ones. The sign for sleep is achieved by making our dominant hand travel in front of our face as if it was trying to close our eyes. 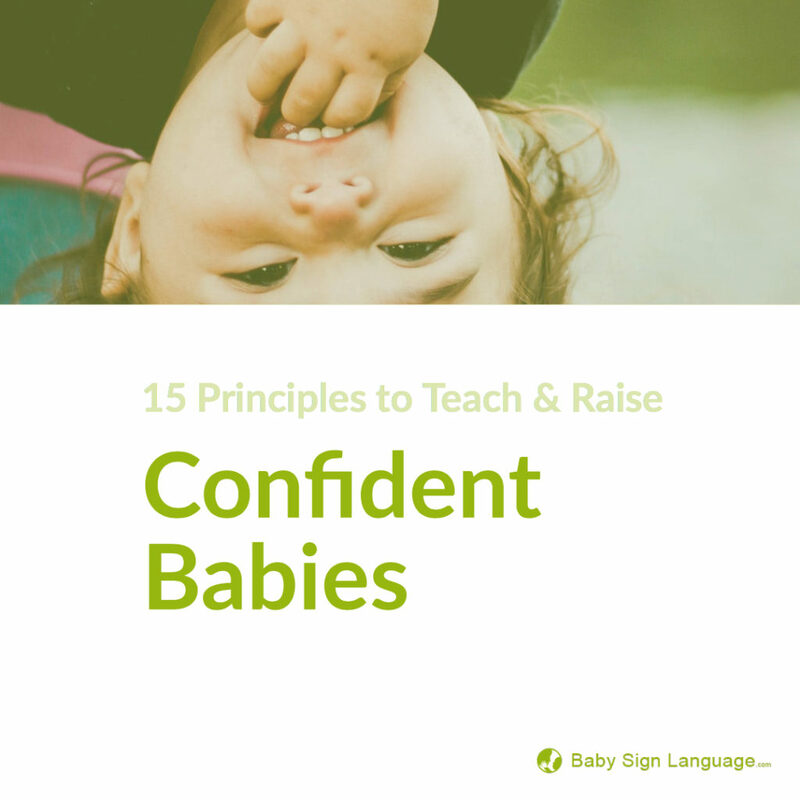 At Baby Sign Language we have gathered the best available resources to learn how to sign. Our kits feature the best of the best regardless of brand. Real and received speech delays are not uncommon in babies and toddlers. In fact as many of 10% of all children suffer from a voice, speech or swallowing disorder that they may later overcome. Addressing the needs of a child with speech delays while challenging it is still less traumatic than facing a child who is already well on their way to full speech and suddenly stops talking. Surprisingly, this scenario is far more common that you will ever imagine. We frequently get questions from parents who are startled when their little ones suddenly stop speaking both at home and in social settings. Once the pediatrician and audiologist have excluded auditory issues and potential scenarios like autism spectrum have been excluded it may be wise to explore the possibility of selective mutism. Selective mutism is a complex and difficult to diagnose condition where the toddler or child only speaks in certain settings. The condition is often tied to anxiety and social phobia and appears to have a genetic element. Selective mutism may take place only at school or social settings and in some instances it is associated to fear triggered by a person within the household. To be clear, selective mutism is not the same as traumatic mutism. If your toddler has been diagnosed with selective mutism there are many options you can explore to help your toddler embrace speech once again. Early intervention is key. If you have just received a diagnosis of selective mutism we encourage you to become familiar with our baby sign language materials specifically designed for toddlers. Through music, clear real-life images and simple directions our resources can quickly provide a toddler facing SM an emotionally accessible tool to communicate what matters most to him. Imagination is both innate and cultivated. What and how you play with your baby will set the stage for success when it comes to their ability to visualize experiences outside their context. As you begin reading to your baby or toddler take the opportunity to foster their imagination by expanding the narrative and including relevant signs and images not normally available in their day-to-day experiences. We are also engaging in role play and including words like monster, fairy and elves. We have included all of these signs in our Dictionary which is available online and as a book in our baby sign language store. Through the use of books and movies you will be able to expand your child’s imagination as well as his vocabulary. The earlier you start the better the results. A weekly trip to the library may just be the most precious journey in the adventure of learning and growing up.